How can we use this data? Just recently I had a look at the publicly available booking data of Hamburg’s bike-sharing system StadtRad. DB Connect, the bike-sharing operator, publishes all booking data in their Open Data Portal. As such, we can examine every bike rental with information about start and end times, rental stations, booking devices etc. and relate them to (anonymous) customer IDs. Obviously, bike-sharing operators use this data for running their business. From monitoring their fleet, handling their payments — this data is a central asset in their operations. Where to build new stations or expand existing stations? How to fulfill more demand and increase revenue by improving relocations and better scheduling maintenance work? How are costumers booking a bike and which software applications should be further developed — Android, iOS, Windows Mobile? For 2016 only, this dataset contains more than 2,700,000 single trips. Although there are much more cyclists using their own bikes, it can give us a much better impression. So how to use this data? Cities can improve and enrich their existing knowledge and use it to plan new bicycle paths or renew existing ones. Furthermore, local authorities can better estimate the value of these bike-sharing systems. Especially when cities subsidize the operation of these systems, or if they want to introduce a new system, they can use this data to support their arguments or use it for benchmarking purposes. Finally, public transport can learn on which routes bike-sharing substitutes their services and where they complement them. This allows them to adjust timetables and routes as well as improve intermodal transport by providing space for bicycles at their stations and stops. In order to provide clear facts, I kept data manipulations at a minimum level and considered the most recent data from 2016. I excluded bookings that have been made from a “technical income channel” as technicians usually use that channel to reserve bikes for maintenance services and relocation purposes. However, technicians can use other channels like smartphone apps or terminals, too. As such, some bookings from technicians might be still in the data, but I expect them to be insignificant. Finally, when analyzing the duration of bookings, I realized that there has been a significant share of bookings that last 1–3 minutes and had the same start and end point. As many of these bookings were related to specific bikes, I assume that these bookings ended due to broken bikes. Thus, I excluded them in that analysis. All visualizations have been made with Tableau. As the raw dataset contains 4GB of data, I rejected to provide interactive charts on Tableau Public due to storage limitations. Given these assumptions, let me show you some main insights from the operation of StadtRad. It is interesting that these results are very similar to those from the bike-sharing system “Santander Bikes” in London. Rental Starts by Station. The size and color indicate how often rentals started at these locations. Of course, most bike rentals occur during summer. From May to September are rentals on their highest level. When refining this on a daily and hourly basis, we can see that bikes are popular during the morning and late afternoon hours as many customers seem to use bikes for their daily commute. During the weekend, many bikes are used to go home from bars and clubs as well as for recreational and sightseeing activities. 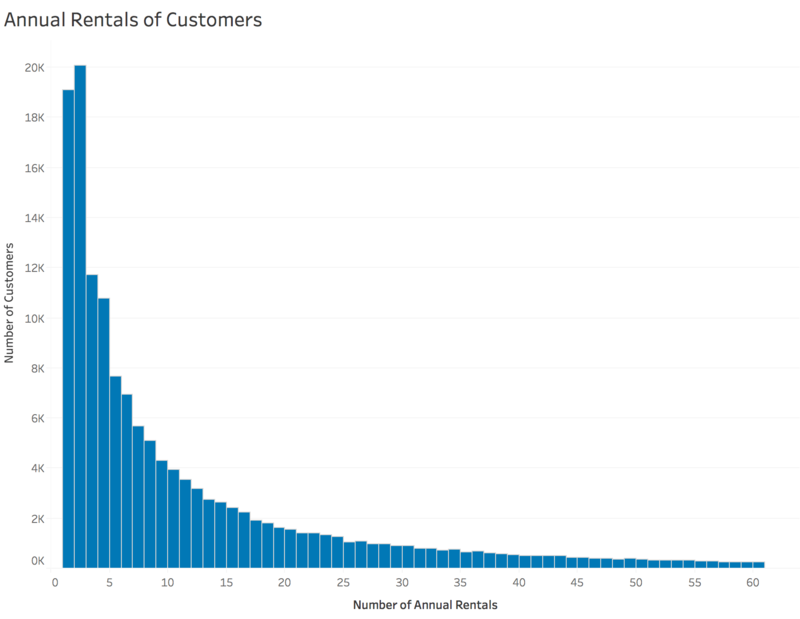 In another article, I used that chart in order to identify potential customers. 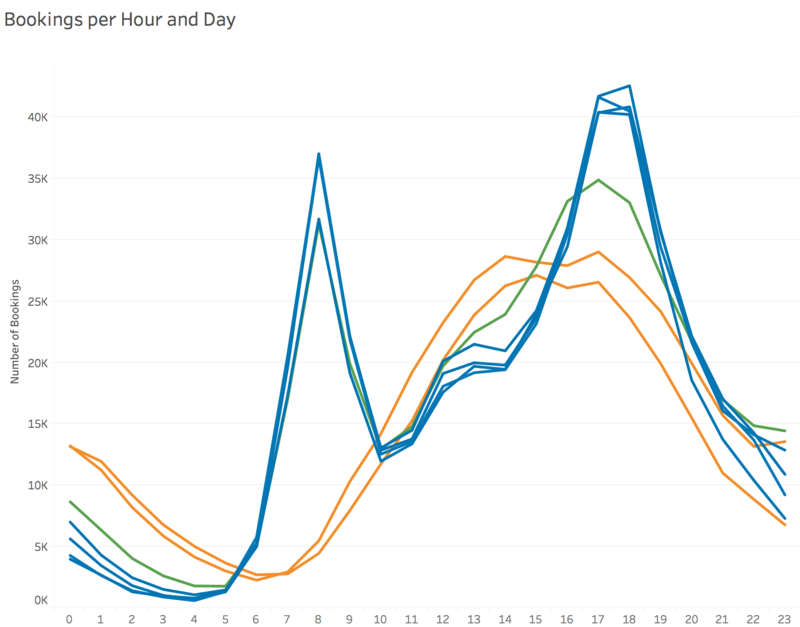 When examining how customers reserve and book bikes, we can see a clear trend towards smartphone apps and terminals. 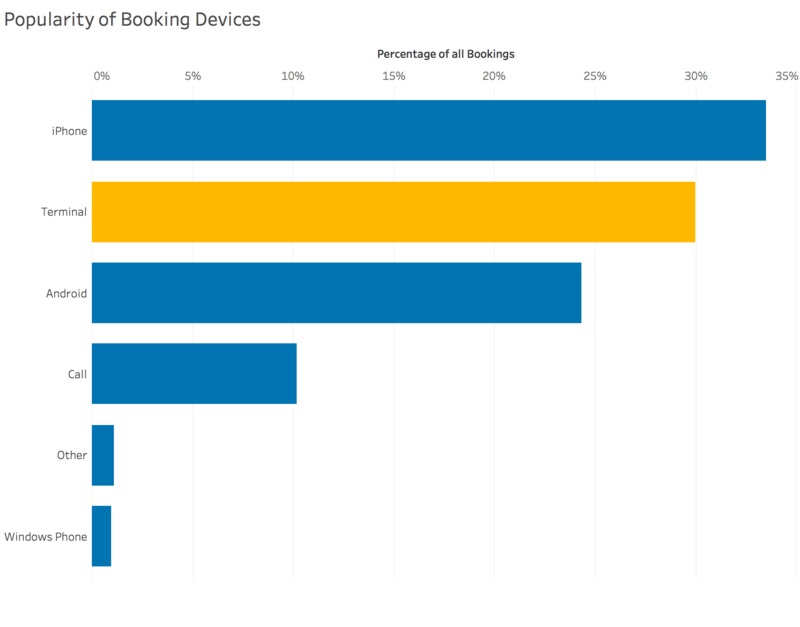 Almost 58% of all bookings have been made from iPhones or phones with Android. Additional 30% came from terminals. I’m surprised that more than 10% of bookings have been made via phone calls. I guess phone calls can be popular for tourist that are trying to avoid roaming fees that occur when downloading the app. But I can also imagine that customer services might have triggered them when customers reported broken bikes and have been equipped with another one. The median trip duration is 13min. That means 50% of all trips last less than 13min and vice versa. As the arithmetic mean is very sensitive to outliers, I am convinced that the median better reflects the average trip duration. As StadtRad is charging customers from the 30th minute onwards, most rentals have been for free. Roughly 80% of all rentals have been for free in 2016. Please note, however, that StadtRad is charging a registration fee of 5€ that is used as a balance for future rentals. 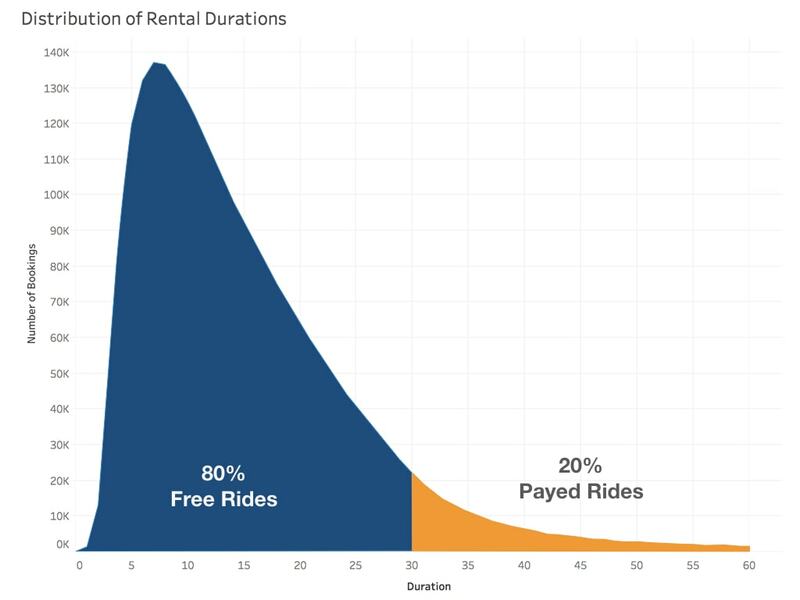 So even if 80% of all rides have been for free, customers paid that registration fee anyway. Given that roughly 80% of all rentals have been for free, we could image customers using their bikes regularly and only pay the 5€ registration fee. For that reason, I took a look how often customers use StadRad’s bikes per year. 50% of all customers use their bikes less than or equal than seven times a year. And only 25% of all customers used them once or twice. In particular, 19,000 customers used a bike once and 20,000 customers used a bike twice in 2016. These results present a fundamental overview of the operations of the bike-sharing system StadtRad in Hamburg. They illustrate when, where and how bikes are booked as well as how often customers usually use them. Is bike-sharing substituting public transport? How to predict the demand for bikes given historical booking data? Or how do those bookings placed by phone differ from those who have been made from smartphone apps?